These glittering aquatic ornaments are a cute way to stray from traditional Christmas decor. If you're not into toy soldiers, sugar plum fairies, cheesy Santas or prancing reindeer, but you don't want to skip out on the festivities entirely, consider adorning the boughs with merry marine life. 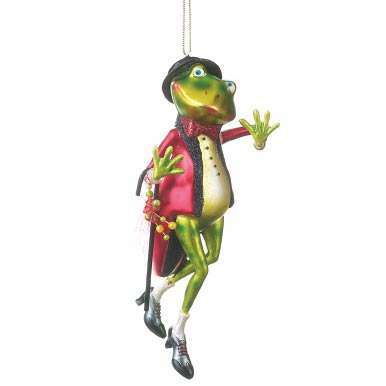 The Charleston Frog ornament wears a shimmering tux and tie... and miraculously found a way to squeeze his webbed ones into a pair of high heeled dancing shoes. Since dancing solo is no where near as fun as partnering up, pick up a female Charleston Frog ornament to complete the collection. She's got a fluffy feather to accessorize her vibrant pink dress and a cheeky attitude to go with it. Frogive me, but I think these little ornaments are too cute to keep locked up the rest of the year -- they would look fantastic dangling off the edge of a desk lamp in the off season. Any real collector knows once you stop, you can't stop adding, which is why it's only appropriate to introduce you to the Luscious-Lipped Kissing Fish Ornaments, a beautiful assortment of glitter-coated fish and seahorses and all with a fin full of attitude and blinged out pouts to prove it.